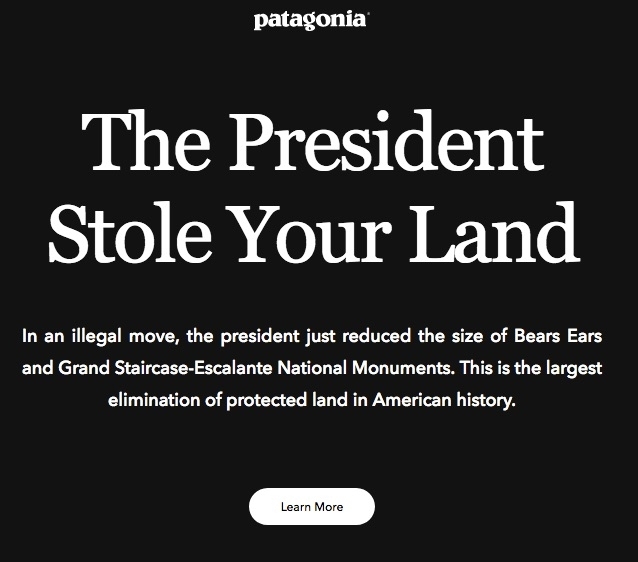 The outdoor clothing and gear retailer Patagonia has been getting a lot of attention, mostly positive as far as I can tell, for turning its home page over to a political campaign with the emphatic headline, "The President Stole Your Land." The website claims, "In an illegal move, the president just reduced the size of Bears Ears and Grand Staircase-Escalante National Monuments." A screengrab from the Patagonia home page. I haven't formulated an opinion on the land issue. But it sure does look like a case of corporate political speech by Patagonia. When it is Citizens United or the Koch brothers engaging in political speech, the left gets all worked up about how it's a threat that supposedly undermines the integrity of our democracy and underscores the need for campaign finance "reform." But when it's Patagonia criticizing the president on environmental issues, the supposed danger of corporate money in politics in the post-Citizens United world suddenly doesn't seem to be so dangerous. It's almost enough to make a person suspect that what the left is really upset about isn't corporate political speech, but the particular content of the speech by some corporations. That is, it's not all corporate political speech they want to outlaw or burden with cumbersome disclosure requirements. It's just the corporate political speech they disagree with that they want to outlaw.